Today marks the martydom day of the Ninth Guru, Guru Teg Bahadur Jee Sahib and the three Great Gursikhs - Bhai Mati Daas jee, Bhai Dyaal Daas Jee, and Bhai Sati Daas jee. 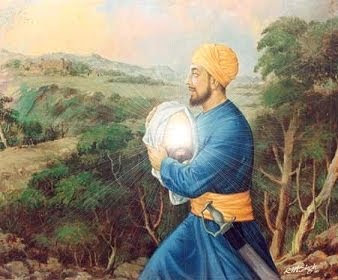 Guru Sahib's sacrifice is unmatched and unparrel in world history. Many people have given their lives for their own family, their own country, or their religion, but no other early example can be found in history of someone who sacrificed themselves for the sake of another's religion and for the sake another's freedom to live in peace. May Guru jee inspire and bless us all to live selflessly and make our lives of benefit to others and the world. Dhan Guru, Dhan Guru Ke Pyaare. He protected the 'Tilak' (forehead mark) and 'Janeoo' (sacred thread of the Hindus) which marked a great event in the Iron age. For the sake of the innocent, he laid down his head without expressing a sign (of pain).13. For the sake of Dharma (righteousness), he sacrificed himself. He laid down his head but not his faith. They asked him for the performance of miracles, but he refused, deeming them unworthy. 14. Defying the king of Delhi (Aurangzeb) he broke the potsherd of his body and left to be with God. None could perform such an unmatched great act as that of (Guru) Tegh Bahadur.15. The whole world mourned on the departure of (Guru) Tegh Bahadur. The world weaped but the heavens resounded in joyous celebration.16.